Andres Medical Clinic provides advanced imaging services comprehensible to our patient community. In AMC, we offer Venous Doppler Ultrasound with the state of the art Acuson Ultrasound equipment. A Doppler ultrasound study is a test which uses sound waves to examine the structures inside the body and to evaluate blood flow at the same time. With this test problems with the veins can be detected. The swift results brought by imaging technology helps our medical team and the patients for the discovery of illness in advance and lead to better treatment. • Venous Ultrasound is noninvasive. • Ultrasound imaging does not use any ionizing radiation. • Ultrasound scanning gives a clear picture of soft tissues that do not show up well on x-ray images. • Venous ultrasound makes the detection of blood clots in the veins and illustrate the passage of blood in blood vessels. 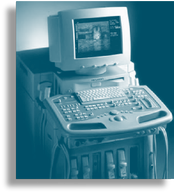 • Ultrasound is more economical compared to imaging methods.